Today we’ve updated our side-by-side editor to allow it to grow on features and be more integrated into our system. Faster! Our Side By Side editor is now even faster than before! Hidden behind modals and 2 - 3 clicks you now can directly access the settings of your story. Jump back in your publishing version history just like that. The side by side editor and it’s composing feature can now be found on the right side. Why we did this change is to make sure you can stay in your normal reading flow - which for most of our current customers is from left to right. You can now first look at your content - click on it - edit and save it in just one clear flow through the editor. You can even skip the save button click by using the save shortcut everybody knows. “ctrl + s” for windows and “cmd + s” for mac. Never be distracted by our component full-screen overlay ever again. Now the “add blocks” button allows you to directly add new components in the sidebar. One of the most important - and before hidden features - your content preview. You don’t have to resize your browser window or switch to mobile devices. Simply press the preview button and have direct access to the most common sizes & even a random width mode (some call it disco mode). Before you would have to use the component breadcrumb to navigate to the parent of the current component - look for the component - now you can directly copy the component you’ve clicked on. The normal copy, delete and drag & drop are still on the same position - directly at your component. We take your feedback serious so we’ve added the name of your current story now in a more prominent place. 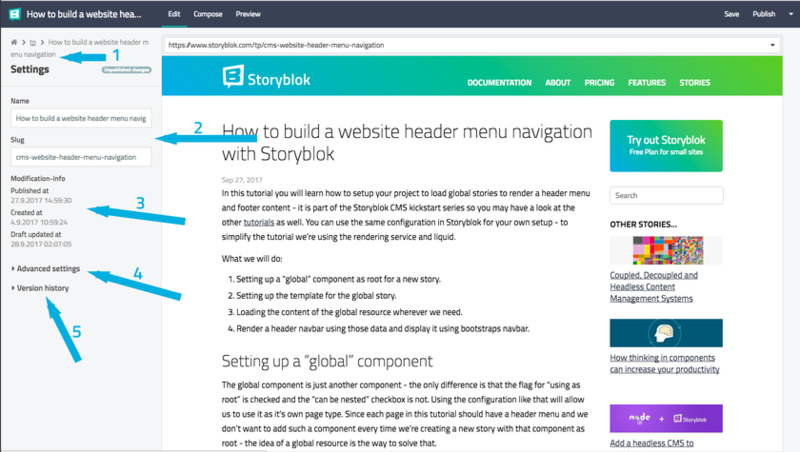 Now it’s directly next to the also newly introduced Storyblok logo which lets you access the main navigation from everywhere in the editor. Storyblok is all about speed and performance for developers and editors. Developers shouldn’t care about the interface and the CMS at all. But Editors should love the way they can editor their content and help developers getting things done and editors to create outstanding content. You can start using our new editor NOW in your own space. The update is now available on Live for every user of Storyblok! As always - we’re looking forward to hear your feedback, features requests or similar right down below in the comments!